Alfred Bennett Bamford (1857 – 1939) was born and bred in Romford. A student at the Camden School of Art, he had a painting accepted by the Royal Academy for the first time in 1883. He was a contemporary of Louis Burleigh Bruhl, another Romford lad, with whom he often exhibited. In 1907 he became the art master at the newly established Chelmsford County High School for Girls. 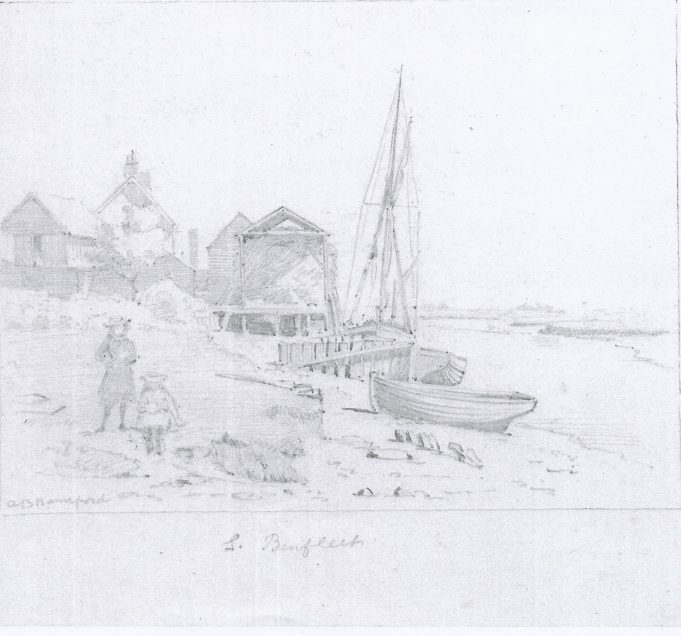 Teaching does not seem to have hampered his prolific output as by all accounts he was responsible for the largest collection of Essex sketches. Alfred’s other passion was the Volunteer Movement. He entered the ranks of the First Volunteer Battalion of the Essex Regiment and by 1897 had risen to honorary Major. Although retiring from the regiment in 1901, he was put in command of a prisoner of war camp during the 1st world war. Many of his sketches and paintings were of the areas around Havering and Chelmsford and they were donated to those towns when he upped sticks and moved to Cheshire in 1930.